Murder By The Books, the latest offering from Mysteriously Yours Dinner Theatre, was one of the funnest shows I’ve seen in a while. It’s a classic whodunit murder mystery experience built around a cast of famous literary characters. Almost. Feeling nostalgic lately and missing my Dad (who took me to my first and only dinner theatre for my 10th birthday), I decided to relive the experience as an adult. I am so glad I did. As we made our way through three delicious meal courses, we were greeted at our tables by the cast whose names are remarkably familiar: Harry Whodunit (Pierre Trudel, who also doubles as Hercule Perrier), Miss Marbles (Barb Scheffler), Watson (Simon Esler), Sherlock Holmes (Tom Melissis), Bessy Whodunit (Birgitte Solem, who also wrote the script), and of course Agatha Cristal (Michelle Regal). During this mingling, the cast gave us a sense of their characters’ personalities and intentions—the highlight for me was being hit on by Melissis’ handsome yet bumbling Sherlock Holmes—and also dropped hints that would come in handy when it was time to solve the crime. During the performance—which itself was enjoyable, especially when the cast strayed from the script into improvisation—a murder occurs. More clues are revealed vis-a-vis the script, and each guest also has an envelope containing three clues which we are told to read at various points in the evening. The cast played well off of each other. I don’t want to give away too much about the plot, but I will say this: one, the action happens mostly amongst the crowd, rather than on stage, and it is highly interactive; two, I smugly over-estimated my sleuthing abilities! Solving the crime was not easy, so I suggest paying close attention throughout if you want a chance at winning a prize at the end (a few guests who give the right answer are selected). And of course, how can I talk about dinner theatre without mentioning the food? While I was expecting a decent meal, I wasn’t expecting the level of tastiness on offer from chef Jo Lusted. We both got the delicious Bessy’s Fall Garden Salad, which was both vegan and gluten-free, and featured these delicious curry spiced sweet potatoes, roasted nuts, baby kale, and a wonderful vinaigrette. For the main I ordered Dr Watson’s Braised Beef Brisket, and Marcus chose Chicken Paprikash A La Harry. While the brisket could have been more tender, it was delicious and came with the best sour cream and chive mashed potatoes I’ve ever had. Marcus—who is Polish, and has a mother famous for her Paprikash—also enjoyed his main (but stated that his mom’s is better). I was also pleased to see both vegan and gluten-free options. For dessert (neither of which were allergy friendly, sadly), we got one of each: Hercule’s Cheesecake Cup, and Miss Marbles’ Pear Tart. While the ginger-infused creme Anglaise in the tart was sumptuous—as was the tart itself—we were both in agreement that the cheesecake was otherworldy. It was the perfect end to an incredibly delicious meal (I took a picture if you’re interested). While we both had a really great time at Murder By The Books, we had one critique. The whole experience lasted roughly 4 hours, and much of that passed slowly (the overly warm venue only made that worse). If there was a way to get the action started before the dawdlers (those who take their time in ordering, latecomers, etc.) get their food, that would be ideal (though I understand the limitations of having servers out amongst the cast). We were both very thankful that the second act of the show was shorter, and passed more quickly. Overall, it was a fantastic experience, especially during the holiday season. 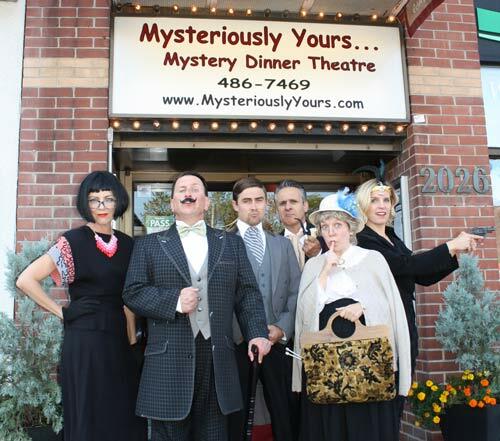 Mysteriously Yours Dinner Theatre seems like a fun option for unique office parties (and several were present), for large families, or even for a first date. Why thank you Ms. Gillis! Why is your cast list incomplete? Do not all the actors deserve credit for their hard work? Seems extremely unfair. Sadly, sometimes the complete cast listing isn’t available to writers, though we certainly do our best to find that information. I reached out to the theatre and have added in the rest of the names I was initially unable to find. Someone just pointed out to me that you named all the male actors, but only one female actor. Why is that? While I have added in the rest of the names, I only listed the names I could identify from the website’s performers page. My apologies for not reaching out to the theatre sooner for a complete list.